Girl Kuripot Girl Kuripot: Contest Alert! Win 160,000 Miles! I just love Frequent Flyer Miles! It pays to start investing on loyalty now like I said in my last saving tip post. Sometimes, you earn the miles. At many other times, you win the miles to get a trip around the world! Let Flying Blue take you closer to that dream by giving you a sense of the many sensations you will feel once you get that 160,000 miles! 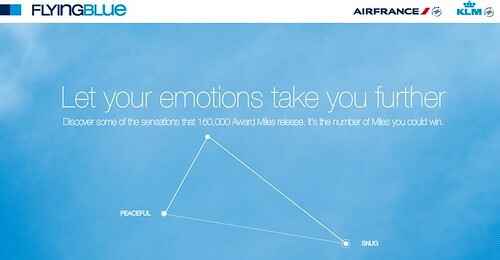 Choose which emotion you would like to feel and the journey you would like to take with Air France and KLM. Release new emotions and open up the possibility of experiencing the world of Flying Blue, all made possible by Air France and KLM. After you've reached Refined, Liberated or Daring, just be ready to give your Flying Blue member number or sign up for one. This dream ends for those who do not make it on April 30, 2011 French time! The feeling of regret might just take over if you do not give your all for travel. Have it all with this promotion!